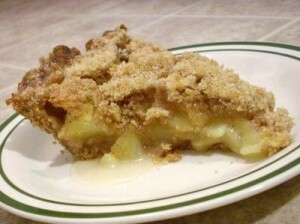 Apple Crumble (Pie) recipe by Faryal at PakiRecipes.com. To prepare the topping, sift flour in bowl. Add butter and well rub with hand until mixture resemble fine breadcrumbs. Put Apple in a deep oven proof dish. Stir in all remaining ingrdients with a spoon. Sprinkle the prepared topping over the applr mixture and bake in fairly hot oven(200C 400F or gas mark 6)for 30 minutes or until topping is golden brown and filling soft when pierced with skewer. Serve with hot custard or Vanila Ice cream. sounds so easy will try it.